Errrrr, OK……where did the last 6 months go??? a regularly updated website or web page, typically one run by an individual or small group, that is written in an informal or conversational style. add new material to or regularly update a blog. As you can see from the above, you may have been led to believe that a Blog is a regularly updated bit of webspace, with somebody’s ramblings. Well my dear reader……..you have been misled! Because as you can see from our Blog, it’s actually a webpage that is updated once every 6 months………so there! OK…….hands held high, you’ve got me! I’m rubbish! But in my defence, we’re that busy and then Christmas happened and before I knew it I was saying to Hannah, “oh, I’ll have to do a Blog post about our ordering times as it’s January, our busiest time, to let people know our time scales. It must be a month or so since I did one”……..6 months people!!! SIX. MONTHS! Is it just me, or did 2014 just disappear?? 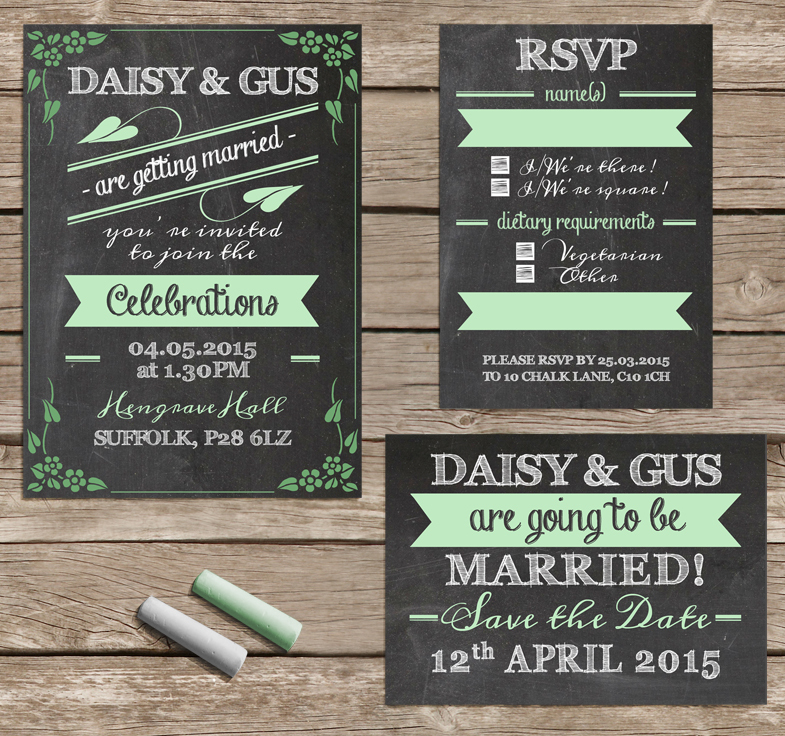 I haven’t even told you guys about ‘Chalk & Cheese’, our blackboard inspired invitation range, that, let’s face it, is another awesome new design, put together by the talented Hannah, see……..
Now I know you know this already but I’ll say it anyway. As with all of our designs, all colours and wording can be altered to suit your wedding day and theme. Good huh?! The other reason I wanted to pop by today is to just have a chat about our ordering schedule and time scales. The beginning of the year is always our busiest time, Christmas is over and couples then crack on with wedding planning. We get an influx, we love it but it does break our heart when couples expected time scales are out of our reach. All of our stationery is designed and put together by the wonderful Hannah, she’s a one man, talented band! This is why we have a ten day design rule. Any changes, drafts and wording, can take up to ten days, depending on workload. Even if you love your draft design and just want some wording changes, this goes back into the pending work folder and can take another ten days. It’s worth it though, to get everything perfect, promise. Then, when you’re happy with your fabulous perfect design, it goes to the production side. We do not out source our printing, we do everything ourselves, to ensure a finish that we and our couples are happy with. Then together, myself and Hannah, get our make on and we lovingly hand craft your stationery, as if it were our own. We quote a four week production schedule, once your design is signed off and printing has started. In busy periods, it usually is four weeks. We always hate it when couple’s deadlines are out of our constraints. As a rule of thumb, it is never to early to start thinking about your wedding stationery. We would advise, that you would start the process and contact us, at least two months before the date that you would like to send them out to your fabulous guests. For example, our tightest time scale at the moment, for invitations that would be sent at the beginning of April, for perhaps an August wedding, would be now, or at least the beginning of February.